Manic Panic Flaming is fluorescent red. It fades to a nice orange very much like Electric Lava and might as well be the same color except that Electric Lava is a tiny bit more orange at the beginning. 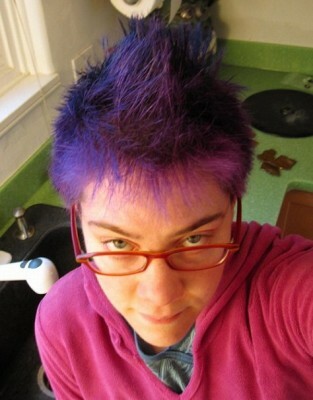 Manic Panic Purple Haze begins as vaguely reserved rich red-purple (not to be mistaken for a natural color, but not as stand-out as blue, for example), but the red disappears after a shampoo, leaving a vibrant purple that is not even slightly violety. Manic Panic Enchanted Forest is anything but. Failed to make much of an impression on my hair, coming out a dingy gray-green of which I moved quickly to rid myself. Manic Panic Amplified Ultra Violet is a bright, striking violet .. for a few days. This color doesn’t stick well in either the cream or the gel formula. Use only if you’re willing to reapply it every week and can accept that most people think it’s blue.